What follows is a chronological record of posts sent from Grand Manan, Canada, to various Internet discussion groups. June 13 ~ Across the road is a narrow lane toward the harbour shore. Walking down the lane is one of the things we do. The sides of the lane are covered in unmown grass that slopes higher and higher toward borders of budding and flowering shrubs. Beyond the shrubs are the greening trees of a small, mature forest. Just beyond two summer homes, after the lane passes the end of the trees, two fields open out, toward the shore. One of the homes was opened only last week. It sits peacefully in the bright sunshine as we pass. All is quiet within. We release the leash, and Gabby is off in a flash, circling each of three trees centered in the field to the left. She leaves a message at the base of each tree. The neighbor's dog will appreciate it. Gabby was here. Our eyes follow the contoured waves of the grasses and wildflowers toward the opposing field. Buttercups! Tens of thousands of buttercups! Buttercups from shuttered house to shore..... Bright yellow buttercups, swaying dance-like to the push of the gently blowing breeze. Nestled between the buttercups are thousands and thousands of spiking blue flags, pointing toward the empty sky. And lupines.... blue-capped, white-capped, barely-capped lupines, waiting a turn to erupt into their own special shades of color. And there, in the center of the lane, where the tires never touch and the grass always grows, is a single mound of blue-eyed grass. It rises as high as it can, but not so high that the next car sweeps away its tiny blue flower. Gabby reaches the rocky shore. The tide is just starting to ebb. She looks back and waits for us. The water is as cold as it always is. She goes in up to her belly, prancing her feet and wading, very unlike her reaction to bath water. Gabby hates the bath, but she loves the shallows of the harbour and the walk down the narrow lane to get there. July 8 ~ I cannot imagine anything more rewarding than to watch the summer sun set over Grand Manan Channel. Sure, the colors are vibrant and the distant clouds are consumed in flaming rainbows, just like every other beautiful sunset in every other part of the world. But here, the usually-swirling eddies of the Bay of Fundy seem to anticipate the event and suddenly become noticeably still. As if on cue, a group of porpoise leapfrogs across the watery reflections, breaking the unexpected silence. Their splashes entice the curious seals who begin a game of playful frolic. In the distance a Minke whale rises and falls effortlessly, moving toward the sound as if to center stage. When the last bit of sun disappears, the remaining sky explodes into bubble-gummed stretches of colorful clouds, a flock of black and white guillemots flaps effortlessly across the glassy channel to the waiting Maine coast, and a pair of bald eagles pause in flight before careening toward their aerie cliff. The silence returns as quickly as it left, but now it is overwhelming. Darkness descends. The day is gone, and all is right with the night. July 16 ~ Saturday evening, just before sunset, as we sat at our favorite whale-watching spot, a couple in their mid-twenties drove up and told us they were to be married in a few minutes. They just weren't sure they were at the right place. We gave them directions to a spot higher up the road and accepted their invitation to attend their bay-side ceremony. They had come from the province of Quebec, about four hours away, and had arrived with two large dogs on the last ferry. It was their first time here, and they had made all the arrangements over the phone. The clerk of the Court Of The Queen's Bench arrived with two witnesses shortly after the bride and groom. As we stood on the cliff-side platform about 50 feet from the Whistle lighthouse, the western sky filled with streaky clouds and a gentle mist began to creep slowly up the island cliffs. A middle-aged couple from Maine arrived in their Sunday best and announced they were celebrating their 25th wedding anniversary that very day. Another, younger couple with love in their eyes arrived just in time to watch the clouds turn into layers of brilliant color. The groom asked us to take pictures of him and his bride. We were happy to oblige. Other than unlimited smiles, the civil ceremony took place without incident until the bride and groom kissed. At that instant, as if on cue, a Minke whale appeared across the reflected sunset in the bay below. Except for the bride and groom, every member of the small party saw the hulking whale break water, looked at one another in awe, and broke into spontaneous applause. August 21 ~ Not many non-Canadians are aware of the major role Canadian armed forces play in United Nations-sponsored peace-keeping efforts. That is NOT, however, the point of this post. Today, a friend stopped by with his wife to visit us. We had never seen one another before, but we are friends, nonetheless. On the Internet, I had found his name at the bottom of a guest book entry where he had mentioned how much he missed his childhood home on Grand Manan. I responded by E-mail and invited him to view our virtual slide show with pictures of the island. It wasn't long before he replied and shared the fact that he was stationed with U.N. troops in Bosnia-Herzegovina. What followed were months of correspondence in which he taught me about this war-torn country and its people, and I kept him informed of the news from home. I'm not sure it was an even exchange, but we were both enriched by the experience. He came back to central Canada for another assignment a couple months ago. Our correspondence decreased, but our friendship did not. Two days ago, my friend traveled for a day and a night to come back to Grand Manan. For him, it was family, old friends, and home. September 8 ~ We joined a group of cyber friends who live right here on Grand Manan and took a hike to Eel Brook Beach where we had a picnic. There was a dozen of us in all and some had never met except on-line in our Yahoo Discussion Group. The weather was superb. Even Gabby came along to wade in the cold, salty waters of the Bay of Fundy, rinse in the fresh water pools of Eel Brook, and gobble down weenies dropped from the cooking sticks of some of the young ones. To the left and right of us were the fantastic cliffs of Ashburton Head and the geologic marvel known as Seven Days Work. There were seals playing in the water in front of us, and a bald eagle, blue heron and seagulls flying overhead. 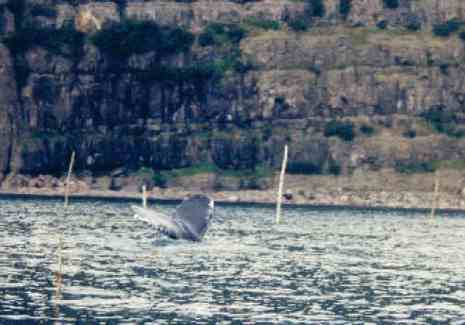 Amazingly, there was also an immature humpback whale who was afraid to swim out of a nearby herring weir. From shore, we watched him repeatedly surface and breach, slap his fin on the surface to create a loud, rifle-like report, and raise his tail as he again dove below. Then another Grand Mananer and his wife came by in their boat and ferried us in groups out to the weir so we could get a closer look at the whale. From the boat, the young humpback was no more than 50 yards away as it blew its way to the surface, lifted out of the water to show the hump behind its neck and the fin on its back, and spread its entire tail for us all to see. It was a truly magnificent animal, barnacles and all. September 10 ~ For lunch yesterday, we decided to take the 54-step stairway down and crossed the little wooden bridge to the Swallowtail lighthouse. We walked up and down the narrow trails and ended up sitting on the east side of the light, overlooking the beautiful Bay of Fundy. It wasn't long before three Minke whales decided to break the nearby surface and announced themselves with scattered sprays of water from their blow holes. We were transfixed as the three frolicked amid the herring schools, seemingly overjoyed with the pure pleasure the bay afforded them. Several seals bobbed carelessly nearer to the shore while an osprey flew silently past our view. Suddenly, the sound of larger blows turned our heads in the direction of Nova Scotia. To the right, two fin-back whales arched ever so effortlessly out of the bay and spouted huge showers above their backs. Then, just as smoothly, they slipped back into the deep, and out again into view. Just at that moment, the ferry rounded Net Point on our right, its two main engines throbbing a warning to every creature swimming ahead. The schools of herring scattered. The five whales plunged downward as the ferry passed swiftly in front of the lighthouse. At the ferry-rail people were taking their last look at Grand Manan. "Goodbye, Grand Manan", seemed to form on everyone's lips.... Some waved and we waved back, knowing full well the wrenching pull this last island view has on an island lover's heart. The drone of the engines started to fade. Only the stern was visible, and then steadily smaller as the ferry broke for the mainland. Silence returned to Swallowtail. In the distance, a single whale blew. Then another, even closer. The ferry was gone. It was once again safe for the whales to frolic amid the herring. September 22 ~ Now that most of the tourists have left the island, Grand Manan has a certain "rural" feel about it. Three doors down, our neighbor's two turkeys are just about ready for Canada's early Thanksgiving. While they fatten, he works with his hands, rapidly guiding twine in and out of netting, floats and sinkers to create huge bottom-set gill nets. Across the road, the birch leaves are turning yellow, displaying their beauty against a mass of evergreen spruce. In nearby door-yards, fishermen have piled lobster traps beside their stacks of freshly-painted buoys. In others, they have removed some of the "houses" from their boat decks and are having the weathered hulls cleaned and re-painted at the haul-out before the lobster season starts again. Two tiny bats have taken up residence under the eave of our shed, and we notice the mosquito population seems to have disappeared. Brown, immature seagulls sweep the front yard almost every day for morsels of food, temporarily relinquishing the waters of Grand Harbour to flocks of Canada geese that are just passing through on their way south. Fall is indeed grand on Grand Manan. Especially if one knows where to look. Illustration of a bottom-set gill net. October 14 ~ One of the great things about living on an island is the terrific beachcombing. This afternoon we took a short walk across the road and down the gravel lane to Grand Harbour. The tide was almost at its peak and the tiny waves were lapping at the shore. As always, Gabby had to go in up to her chest. There is something about the water she just can't resist. For a terrier, that has always surprised us. The three of us combed the beach for anything usable. We weren't gone long, because the last of the beach was rapidly disappearing with the tide. We arrived back at the foot of the gravel lane with several pieces of driftwood. One was a fairly new 4-by-4 post that we need to change the rear deck rail when we install the old stairs we found on the other side of the island. They will not be fancy stairs, since they only go off the back of the deck to Gabby's little fenced-in yard. When we found them washed up on the beach at Dark Harbour two weeks ago, and realized they must have washed over from Maine, we knew they were perfect for our needs. We carried our newest finds up the gravel lane and back across the road to our house. But before we came inside, I temporarily nailed the four steps to the deck just to size things up. Gabby came over, inspected my work and went up and then down the stairs several times. Finally, as I sat with my legs dangling over the side of the deck, she put her front paws on my lap and licked my cheek. She apparently likes the plan for her new "beachcomber" stairs. She gave me her lick of approval. We went up the road about three miles to the next village and down an incline to the pound at the water's edge. Inside, ten men were moving lobsters onto scales and stacking them in crates. Some of the "bugs" were real monsters. There were easily thousands of them. When I asked for a couple one-and-a-half pounders, one fellow laid down two that looked dinky by comparison. I watched the scales tip at 3-1/2 pounds. "$19.50", he said, scooping them off the scale. In the background the other nine men kept moving the lobsters across the scales and into the crates.... The man asked the group in general for 50¢ to change my twenty dollar bill. He handed me two quarters and two wet lobsters, and I was on my way. Are You From Grand Manan?